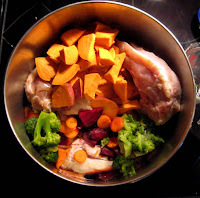 Place 3-4 cups of water in crockpot (can be cooked faster using conventional stove method). Layer chicken, chopped veggies and sweet potato. Cover with water, making sure to leave approx. 1/2" at the top to allow room for moisture generated during cooking. Set to low setting for 8-10 hours. Add calcium citrate, mix well and let cool. Feed at least 2.5-3.5 percent of body weight per day. For example, 20 lbs. dog should be fed approximately 1/2 to 3/4 lbs. daily, split between two meals. For more information about weight loss for pets call the Acacia Animal Health Center at (760) 745-8115 or visit www.aahc.us. I got there lots of helpful content and great information. Thanks a lot for your help. hi you have a nice weblog. I wanna say thanks for sharing this cool posts with us. Keep up this great job.